There are three concepts which I have found very helpful in understanding Slonim: Ohr, Daas and AKShN. I'm honored to take this first opportunity to briefly compare them, iy"H, to the holy paths of Ger & Breslov, Chabad & Mussar, Karlin & Modern Orthodoxy, respectively. "In every Mitzvah that a Jew performs, the Mitzvah value is dependant on the Ohr (Divine Light) that shines within the Mitzvah act. "(…) An analogy: For someone who possesses a handful of copper coins, the value of a single silver coin transcends them all. And one golden coin is more precious than an abundance of silver. So too is every Mitzvah like a coin. The crucial factor which determines the Mitzvah value (…is) how much heart-quality is in this Mitzvah. How much truth is in this Mitzvah. How much Ohr is shining within it. "(…) The entire path of Chossidus of our holy masters from Lechovitch, may their merits guard us, was founded upon this issue. How to enhance the Ohr (…) How to keep a distance from everything that reduces the Ohr. This is the reason they invested so much into elevating the Shabbosim. It's because Shabbos is the day of Neshama Yeseira (the Expanded Soul). The more a Jew invests himself in Shabbos, the more he'll merit the Ohr, which is the source of faith. Likewise they were so very careful about blemishes in matters of holiness (gender relations). For there's nothing which reduces the Ohr of the Neshama like this does. The man may appear externally the same and no one but G-d may see a thing. In the meantime the Ohr of his Neshama has long been extinguished!" Ohr, by no means, was an exclusive of the Lechovitcher (1742-1810) and certainly not of his disciples in Slonim. The Besh"t (1698-1760) revolutionized the Torah world by introducing Ohr into the vocabulary of even the simplest Jew via the many streams of chossidus that burst forth from his wellsprings. Some diluted it for easy access to all. Others held it high and built dazzling communal telescopes, as it were, for precise, periodic gazing. Slonim set its sites on convincing each individual, without fanfare, to arduously build his own, inner telescope, for use in each and every Mitzvah. As per the Shmuess, a concern about the spiritual dangers of inappropriate physical intimacy is one major implication of Slonim's commitment to the Ohr. In contrast to some other chossiduses, however, this is not a militant battle. The Rebbe once told me, with a twinkle, that one of the fine differences between Slonim and Ger is that "they view gender boundaries as if a battle with Satan while we see it more like reading the Sefer Torah. The wife should be adorned, revered and cherished but not taken out of the Ark at will!" Now please don't view this as an official line. The Rebbe was sharing this insight at the beginning of my entrance into the community as a counterbalance to rumors I might have heard about "fanatical" chassidic customs. The Western mind, after all, can't fathom anything intrinsically positive coming out of a curtailment of permissible pleasure. Nevertheless, the general comparison remains a valid one. Ger is a pathway that is strikingly fierce about its guardianship over the Ohr while Slonim is much mellower. It IS a battle that we vigilantly keep up, but not so much out there against the darkness as inwards towards the light. A Gerrer Rav once visited our community on Shabbos and remarked how impressed he was with our Rebbe's calmness and serenity. What he didn't know is how much the Rebbe teaches that one must constantly battle to attain such an oasis of soul as a means for perceiving the Ohr. This brings to mind the holy way of Breslov, which is known for their unabashed love affair with the inner life. Fascinatingly, there has been a historically subtle distance between Slonim and Breslov that I don't fully understand, but I'll try to clarify a little. 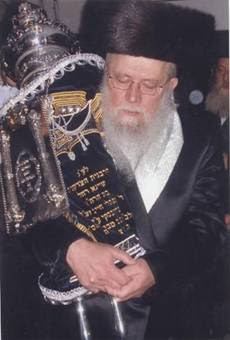 Rav Israel Odesser (founder of the Na-Nachs) was a talmid of Rav Mottle Slonimer in Tiveria. After the Holocaust, with the news of the decimation of the fifteen European Slonimer communities, including the murder of whom we call the Yunger Rebbe, ztsvk"l, Hy"d, Rav Mottle was begged to take over the mantle. He refused to be called Rebbe but for the next decade he was treated as one. He is said to have loved Rav Odesser but was deeply concerned about some subtle dimensions of his emuna (faith). He once said that he went through every single writing of Rebbe Nachman and found no blemish whatsoever… except for one! On the other hand, I was recently told by a chashuva Slonimer, a grandson of the Rebbe who would follow R' Mottle – the author of the Birchas Avraham, zy"a – that his grandfather learned Gemora with Rav Odesser for a period and while he would often have Breslover sforim on their table for learning at every break, the helige Birchas Avraham would never say a thing about it. Hence the hesitancy Slonim had with Breslov was far from any policy. Still, it got somewhat complicated by the fact that the next Rebbe, the famed Nesivos Sholom, ztsvk"l, wouldn't sleep in a room with Breslover seforim! So who knows. Perhaps he felt they were SO holy it would be disrespectful to sleep there! To be sure, the Rebbe shlit"a once remarked to a friend of mine, a prominent Slonimer who teaches in a FFB Breslov Yeshiva, that there are no contemporary implications of the distance which our Rebbes kept from Breslov and, to the contrary, their known mesiras nefesh (self sacrifice) for rising early to take a Mikvah and fervently daven at sunrise is something we should emulate. Still, you'll never see a Breslover at our Tischim, or vica versa, though our main Mea Shearim Shuls are only a few minutes away from one another! This is in contrast to all our other Chassidische neighbors. Perhaps the explanation is that since both share such an unrelenting personal quest for the Ohr, they are wary of how the other does it so differently! For Breslov is willing to dance in the streets, carefree, about its wondrous beauty, while Slonim prefers a private corner for bemoaning its unfathomable depths. As it's written, "my soul is sick with love for You." I don't know the details but I was once told that there was opposition to Breslov from Slonim even in Europe. 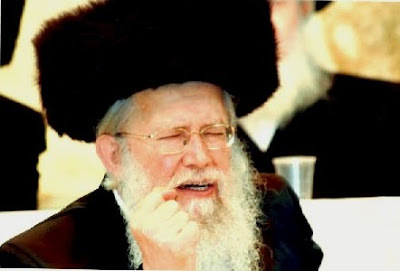 In general the derech of Russian chassidusen compared with the the talmidim of R Elimelech fo Lizhensk and his talmidim, from which also eventually leads to Ger, is that that approach is much more focused on the idea of milchama with the yetzer, the constant battle as opposed to adding more ohr as R Shlomo Karliner said: v'amartem zevach Pesach L'Hashem. When you want to shecht the yetzer hara( v'amartem zevach), then pesach L'Hashem, jump to Hashem. Dancing in the streets is not endorsed by any Breslover gadol. It would be wrong to base Breslov on Na Nachs. I thought I remember seeing Reb Nachman quoted in Nesivas Sholom. Very interesting. Can't wait to read the next two. One comment: You chose some very interesting bedfellows [pardon the lashon; golus has had its influence]: Ger & Breslov, Chabad & Mussar and Karlin & Modern Orthodox. I think you would be pressed to find groups with more differences than these throughout the frumme velt.! Breslovers most often do not go to any tisch. The fact that they don't attend the tisch at Slonim is hardly remarkable. One thing I find interesting in Breslov. Learning just about any sefer written by a reliable source is encouraged. While Reb Nachman's seforim are of course delved into much more, Breslovers will quote from Ben Ish Chai, Chida, Rav Shamshon Raphael Hirsh, Vilna Gaon, Nefesh HaChaim, Chofetz Chaim, Bnei Yisaschor, Reb Tzadok, Sfas Emes and other tzadikim. As long as it's Torah, be it from Reb Nachman or another tzadik. The main thing is Avodas Hashem - following the way of Hashem - and not MY derech. It's not about US, but about HASHEM. Remember we are all different, and different things work for different people. If others don't want to learn Breslov seforim, it's unfortunately their loss. But I feel that who cares if a sefer is from the tzadikim of Lita, Rizhin, Slonim, or another source that is supposedly not "Breslov friendly". If I can gain from it, I would like to learn from them. It’s my gain, their loss. A Talmid: However Breslov is not about making one big cholnt out of everything too. Breslov is strongly built on derech ha Baal Shem Tov, in a way how the Rebbe expounded upon it, and Breslov is thus Chasidus in the first place. Thus, while learning many sources for general broad knowledge is not discouraged in Breslov, there for sure is a focus on Chasidic sources first, when it comes to avoydas Hashem. And except Breslover sforim themselves, it primarily includes sforim of Talmidey Baal Shem Tov and their talmidim.